A Greek philosopher Plato said, "Geometry will draw the soul towards truth and create the spirit of philosophy". Perhaps this is why geometric designs are widely used in religious decorations of many faiths, especially Islam. Our interest in intricate Islamic art was fueled by our unit study of Iran. 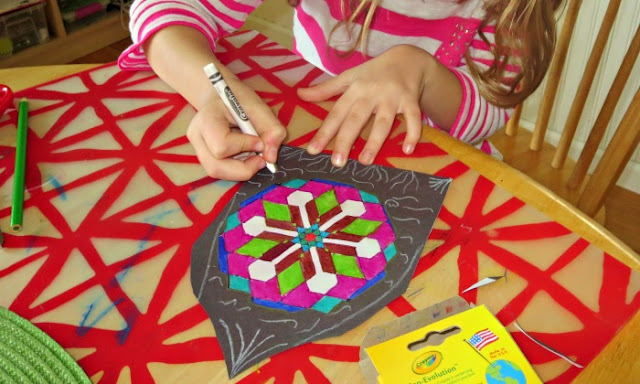 and my 9 year old worked mostly independently to explore geometry and colors of Islamic art with this stained glass project - perfect for students age 8 and up. 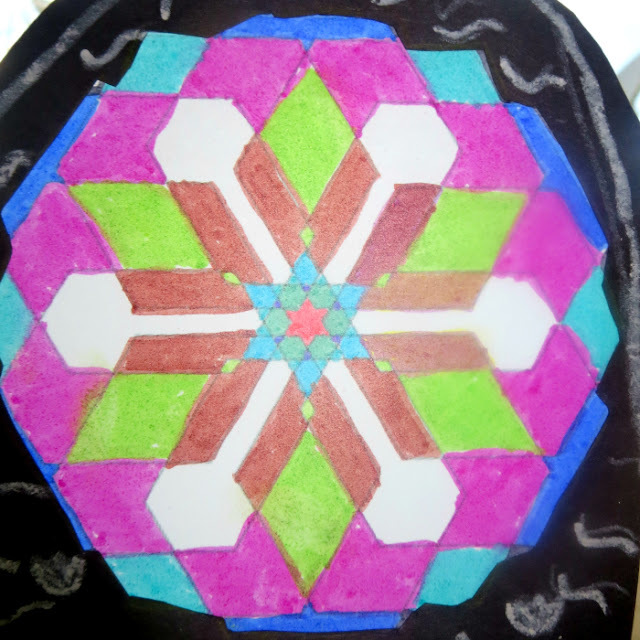 Our initial inspiration came from looking at amazing Pink Mosque of Shiraz when we were learning about Iran and looking at other examples of Islamic art online (courtesy of Metropolitan Museum of Art). 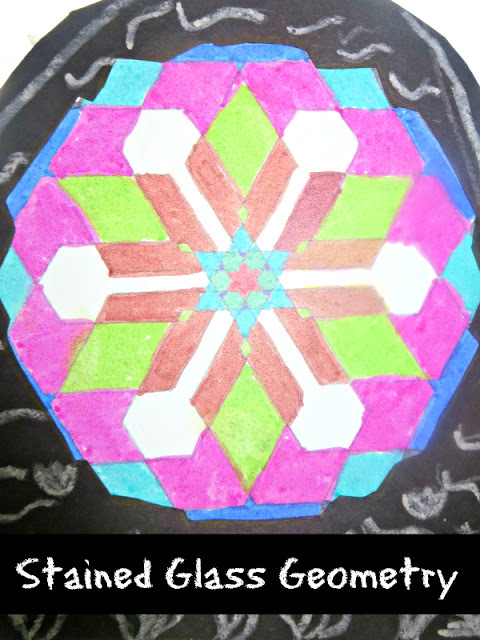 Initially, I wanted to do one of the projects included on Metropolitan Museum website, and then I stumbled upon Islamic Stained Glass Lesson Plan by Artful Artsy Amy that seemed simpler. The original project was done on transparent plastic paper, but we did not have it on hand and chose to use parchment paper for lining baking sheets. As you can see, it also worked out rather well, but transparency would be more brilliant. One thing that we sorely missed was a brighter white pastel pencil for creating designs for our walls. I knew that Smarty would enjoy creating her design online, so I showed her Geokone website, and she could make her own complex 3D drawing in no time at all, I helped her to save it as a jpg image, and my husband had it printed directly on the parchment paper. 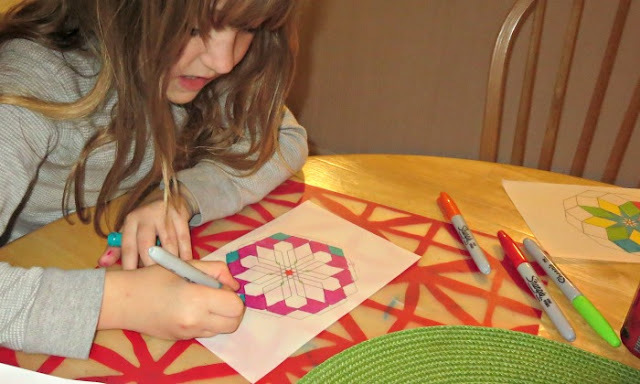 I was doubtful that Smarty will color her intricate design, but she actually stuck with it for more than 30 minutes, chose colors carefully and was very pleased with her end result of day one. 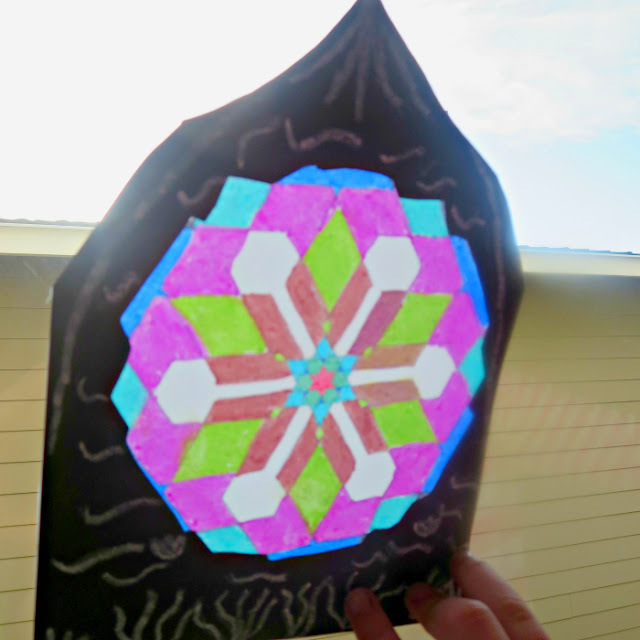 Next day, Smarty created a "wall" for her stained glass with black construction paper. It was fun to see her brainstorm how to cut an opening in a sheet of construction paper that would be just right for her design. 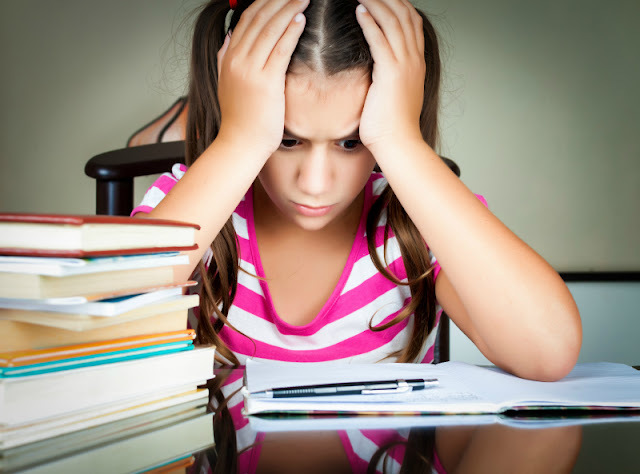 She came with a creative solution of making a copy of her design on a copy machine (she also thought of making her copy black-and-white to avoid wasting ink) and then cutting that copy and using it as a template to trace her window. She was very pleased with her final result, and it now hangs in her bedroom. Do your children enjoy art? What kind of projects have you been up to lately? Oh, my! I love this project! The final outcome is beautiful. Very nice global art project!